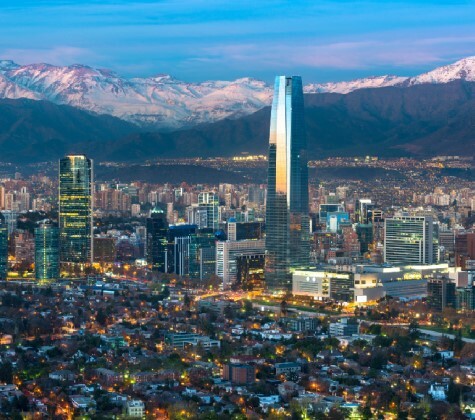 The Republic of Chile is located in the southwestern tip of South America and Santiago is its capital. It occupies a long, narrow strip of territory on the western coast of the Southern Cone that stretches from the border with Peru to the Antarctic Territory, with a coastline extending for 6,435 km. Continental Chile is 4,270 km long, with areas only 90 km wide while other parts reach a maximum of 445 km between the Pacific Ocean shore and the Andes mountain range. Insular Chile is a dispersed group of four oceanic volcanic islands in the Chilean Sea, located relatively far from mainland Chile. Among these, we find Easter Island, one of the world’s most remote inhabited location, which is situated in the southeastern Pacific Ocean. Chile borders Peru, Bolivia and Argentina. It is considered a high-income, developing country according to the OECD. Population: 17.11 million, with 40,5% inhabitants living in Santiago and surroundings, in the center of the country. Human Development Index: 44th position in worldwide ranking, 1st in Latin America. Life Expectancy: 80 for men, 85 for women. Globalization Index: 1st position in Latin America Ranking. GDP per capita US$: 15,780.00; 2nd in Latin America Ranking.